A friend I know desperately wanted a Waldorf type gnome this Christmas. I decided that making two gnomes was just as easy as one…and then I could have one too! Dewberry Soggybottom (on the right above) is a shy, but very sweet once he gets to know you. He is the first one up each morning. He heads right out to forage in the woods. He sees dew on the berries and mushrooms. On his way home to breakfast, he often stops in the meadow to look at the flowers. That can be a problem….he keeps forgetting there is a lot of dew on the grass at that time of day. So when he sits down to look carefully at a flower his pants get damp! Which explains his name! He’s gone off to his forever family and I hear he is very happy in his new home. Cloudberry GreenKnees (on the left above) lives at my house. He spends his days looking up at the sky, both day and night. As a result, he trips a lot in the meadow and frequently comes home with grass stains on his knees! 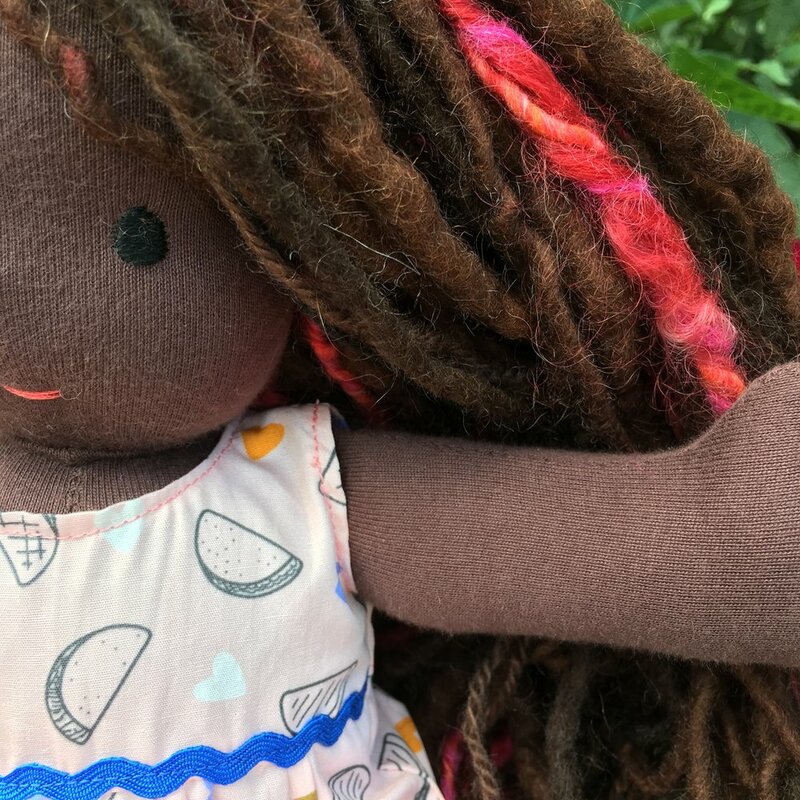 These dolls are based on the pattern in for the small Waldorf doll in Maricristin Sealey’s book, Making Waldorf Dolls. I scanned the pattern and made it a bit smaller than her pattern. I always shorten the length of the arms in her patterns—I just like them better a bit shorter. I knit their hats using a sport weight yarn. Here’s my pattern for a smaller gnome hat. For these dolls who have a 7 1/2 inch finished head, I cast on 32 stitches. Knit 2 to 4 rows of ribbing, knit 10 rows, then begin to decrease at the end of each needle per the pattern in the linked post. For these hats, I decreased every 3rd row. (If you have worsted weight yarn, cast on 28 stitches). I loved making these gnomes! And I love having one of my very own too! Safety Note: These gnomes have necklaces and buttons on their shoes. If you are making dolls for children under age 5, please don’t use bottoms or any necklaces. Cloudberry in his new gingham shirt. Because it isn’t Christmas ALL year! (And his pants are freshly laundered….so, no green knees)! I really have fun making the medium size, 13 inch, classic Waldorf Type dolls using the pattern in Maricristin’s book, Making Waldorf Dolls. I made two more in August when it was hot and humid, and sitting in front of my portable air conditioner was the only smart thing to do! The little girl above, with the bright yellow mohair boucle and shades of white and yellow wool yarn is sitting next to an echinacea variety called Chacita that is in my front yard. When her hair is down, it’s just shoulder length. It’s the first time I’ve put short hair on a doll that isn’t a baby. I think it is pretty cute! Here is the other 13 inch classic Waldorf Type doll. She is a present. I chose the skin color and hair yarns based on what a 9 year friend told me she liked when she surveyed my collection of dolls. I can’t wait to give it to her! The fun thing about these size dolls is that they can share clothes with Bamboletta Cuddle Dolls. And the girl getting this doll has a Cuddle Doll! 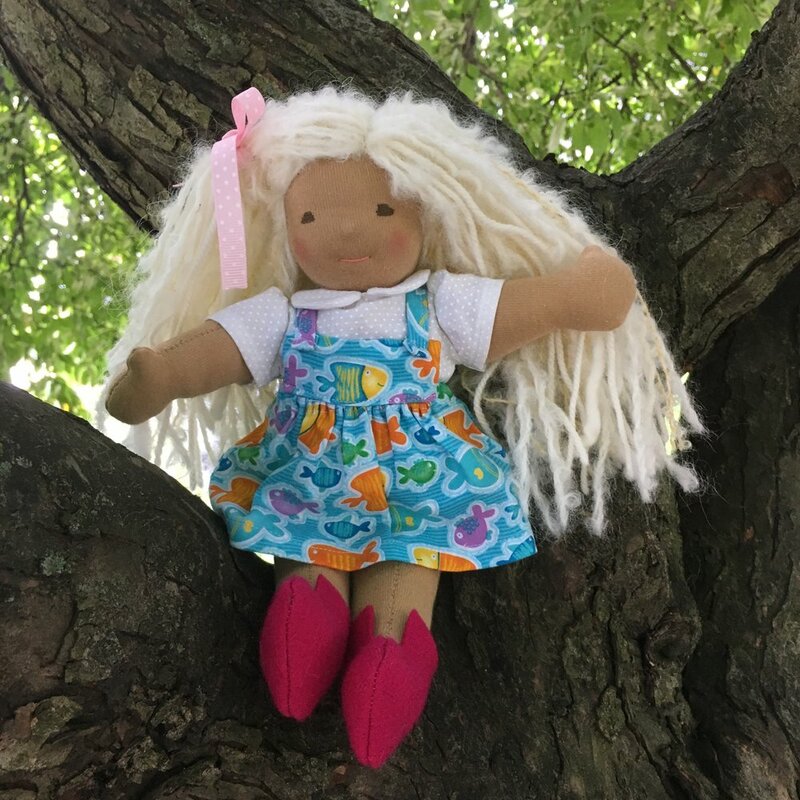 Here’s a link to page of Bamboletta doll clothes. Their inventory changes weekly on Wednesday so there are always new clothes! There sometimes aren’t clothes for every size of doll they make, but they do restock regularly. 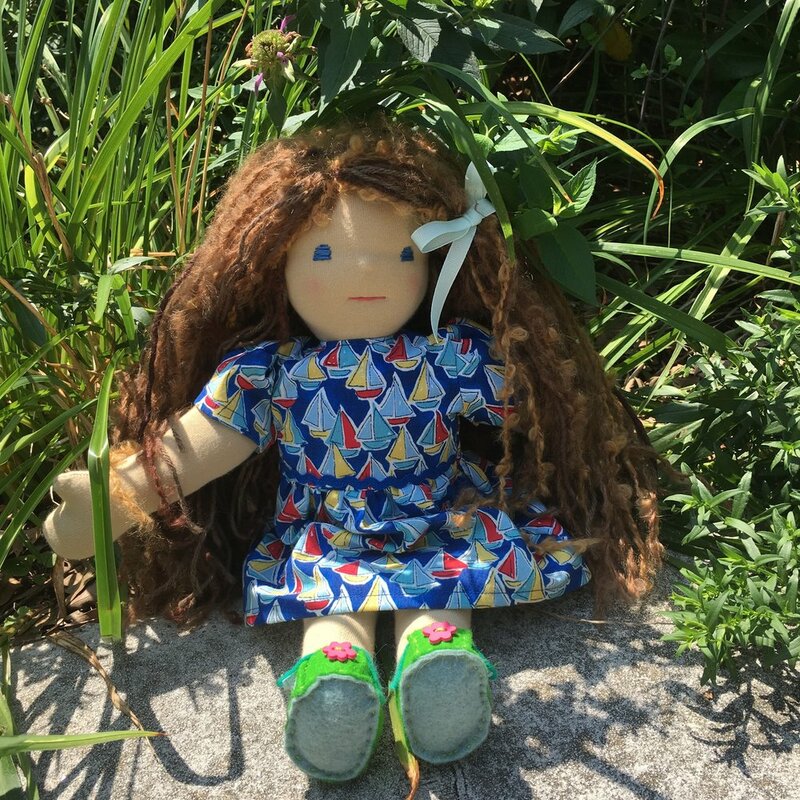 Summertime doll dresses: sharks, crabs and ducks! Bamboletta Cuddle Dolls, left and right, my Waldorf type baby doll in the center. It's high summer and I've been having so much fun making summery dresses for the extended doll family! The dress patterns I draft are usually for dresses with short sleeves. I figured that if I skipped the sleeves and just overcast the raw edges of the fabric, turned it under the 1/4 inch seam and sewed it up, I'd have a perfect sleeveless dress. That was a good idea, but doesn't quite play out perfectly in real life! It turns out, I really need to add some width to the front of the dress bodice, otherwise the dress have a bit of a halter look (see above). For some reason, the bodice back is better than the front. Here's a closer view to show why it would be better to use a bit wider pattern for the bodice of a sleeveless dress. Not horrible, but it could be better! Sleeveless dress with a bodice that's not quite wide enough. The doll is a Bamboletta Cuddle Doll. I went back and redrafted the front and back bodice pattern pieces. This version is better. Here are a couple photos of dolls I made wearing dresses with short sleeves. 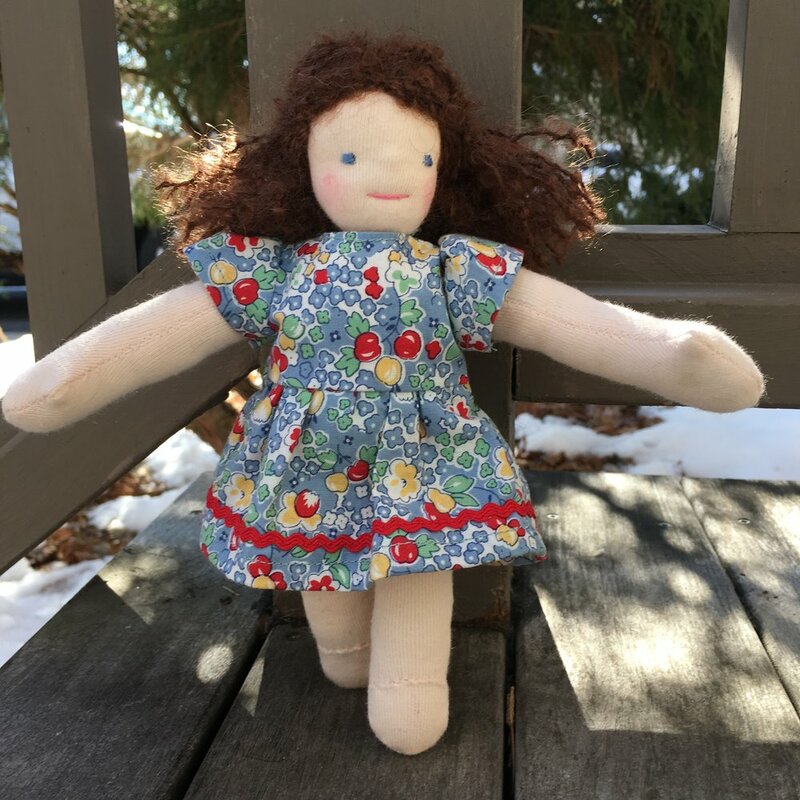 Little limbed doll, pattern in Mariecristin Sealey's book, "Making Waldorf Dolls"
It's been so much fun making dresses with these summer fabrics--sharks, crabs, sailboats, ducks (or maybe they are geese), frozen treats on a stick, tacos, and flowers! I spent the Dog Days of July, when it was too hot and humid to move much (or quilt anything! ), making several dolls. I've noticed that children play with my 10 inch Waldorf Type Baby doll as if she were an older child even though she has the bowed arms and legs of a baby. Over the past couple years, I've drafted an extensive wardrobe of clothes for this particular doll, most of them not really baby clothes. 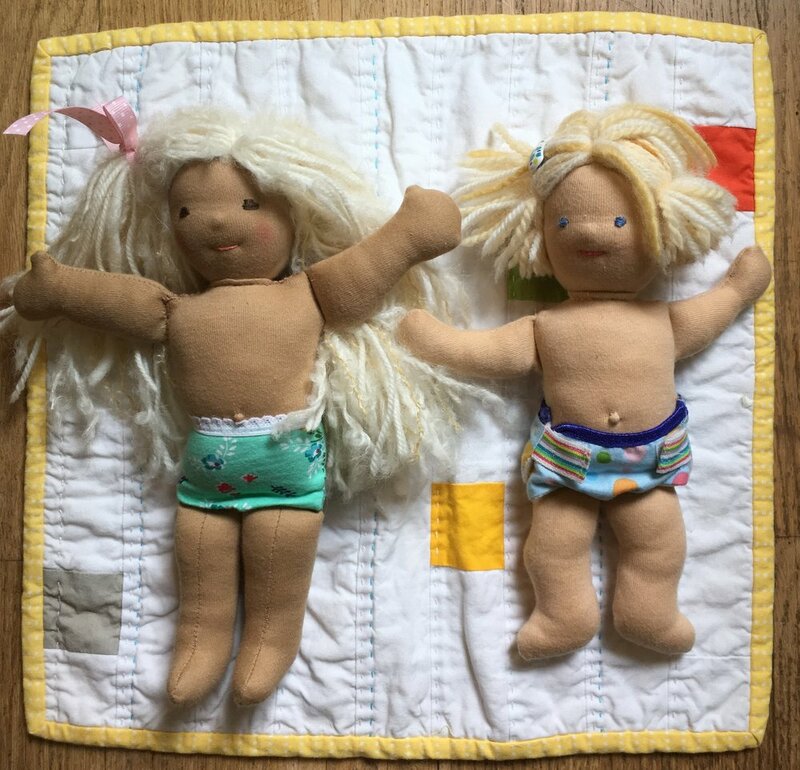 It made sense to try and change the baby's pattern to make an older looking doll. So that's what I did. In the new pattern, the arms have been straightened some and the legs are much straighter and the feet turned so they face forwards. I altered the neck a bit in the new doll and inadvertently the torso became a half inch longer. That meant the dress patterns for the baby doll were just a bit too short for the new doll. It's easy enough to lengthen a dress, but I've adjusted the child pattern so next time I make one it will be exactly the same size as the baby. I did have a bit of trouble sewing on the arms of this doll. Her left arm is better than her right. But she's a prototype, so I'm okay with that. It's so fun to have a new doll that already has a whole wardrobe of clothes patterns that will fit her! Classic Waldorf Dolls. They have simple bodies--a trunk and legs together without clearly defined feet, arms at reach out and a head. They typically stand up better than they sit down, but if stitched carefully at the top of the legs, they can sit. I only recently started making Classic Waldorf Dolls. I have to say, they are fun to sew and they have charming character. I use the patterns in the book Making Waldorf Dolls by Maricristin Sealey. 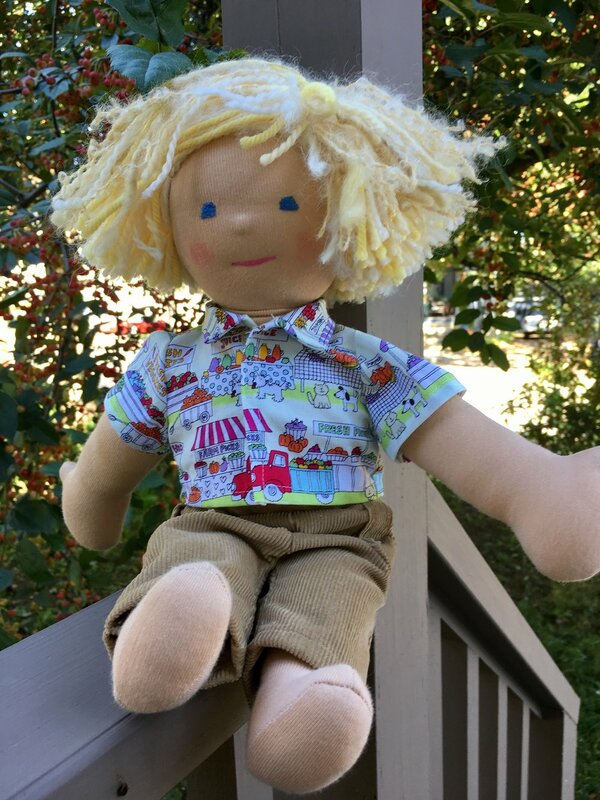 I made Douglas, shown above, simply because I have been collecting fun doll clothes made by Bamboletta for a for a while now. I was planning to purchase one of their 15 inch Sitting Friend dolls but boys that size have been few and far between. So I decided to make a doll myself. Douglas is wearing all Bamboletta clothes except for his shoes (and undies)! I was reading about hair styling in the book mentioned above. It said you can create curls by knitting yarn, dampen the knitting and let it air dry and then undo it. That sounded like fun! I decided to just use straight yarn on the lower two layers of the hair and put the knitted curls on just on the outer third layer. It gives Douglas a cute, sort of un-tidy, free-spirited boy look! Here he is sitting. I managed to sew in decent leg folds on this doll. He's wearing clothes made by the Bamboletta Sewing Mamas! (I made the shoes). NOTE: Notice the difference in his hair in these two photos. The first humid day we had, Douglas lost most of his curls! I used merino superwash yarn and it just relaxed in the humidity. Next time I think I'll use yarn that felts and smaller needles than the #10 US needles I chose this time! Clementine is the another Classic Waldorf Doll I recently made. She is smaller at 11 inches. 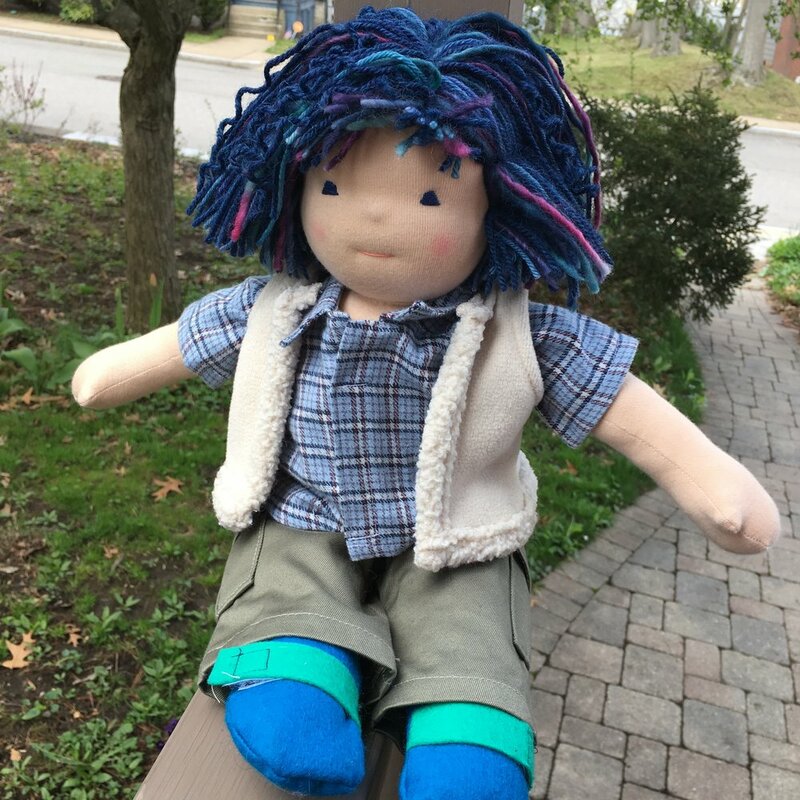 If you have never made a Classic Waldorf type doll, 11 inches is a great size to start with. it is easier hold and sew a smaller doll. 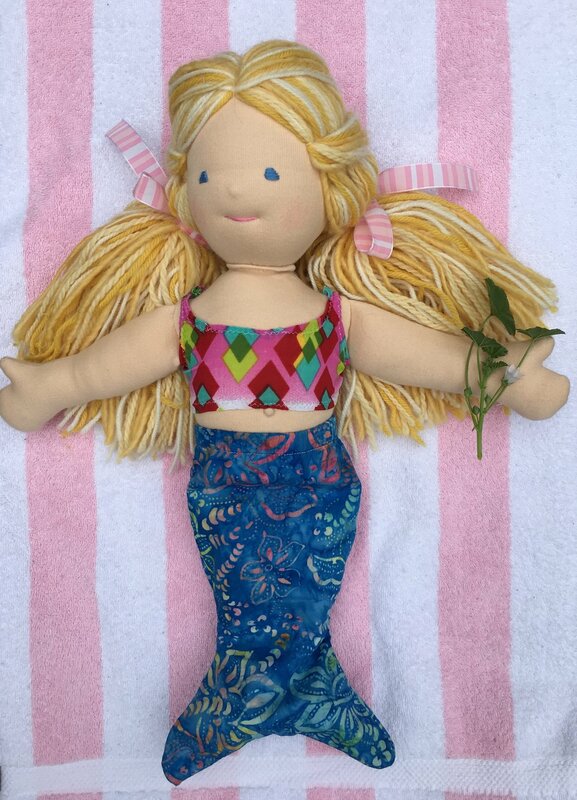 And the finished doll is a great size for a child to take places. I used heavy weight loose mohair boucle yarn by De Witte Engle for her curly hair. 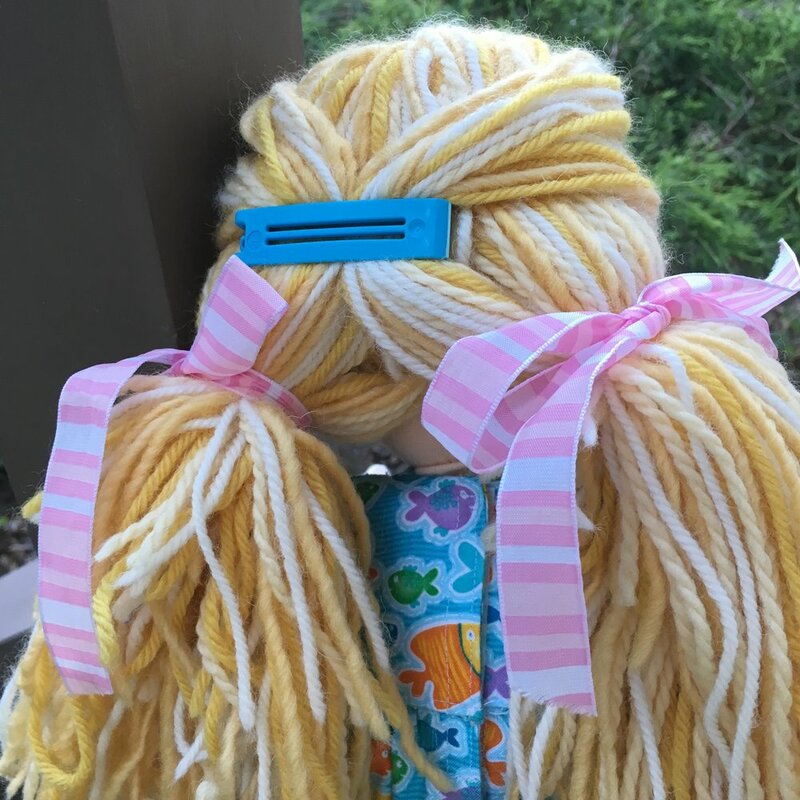 Unlike most of my dolls, I only used one type of yarn for her hair. I love how it turned out! Here area a couple more photos of Douglas in his Bamboletta made clothes taken at the beginning of May when it was still chilly. He is one super cute little dude!! In my April 5, 2018, posts I promised to show a couple revised 8" Waldorf type dolls. These two dolls have larger heads than first 8" doll I made. I think the slightly larger head, 5-5 1/2 inches looks a lot better on this size doll. The first one I made had a head just under 5 inches in diameter. 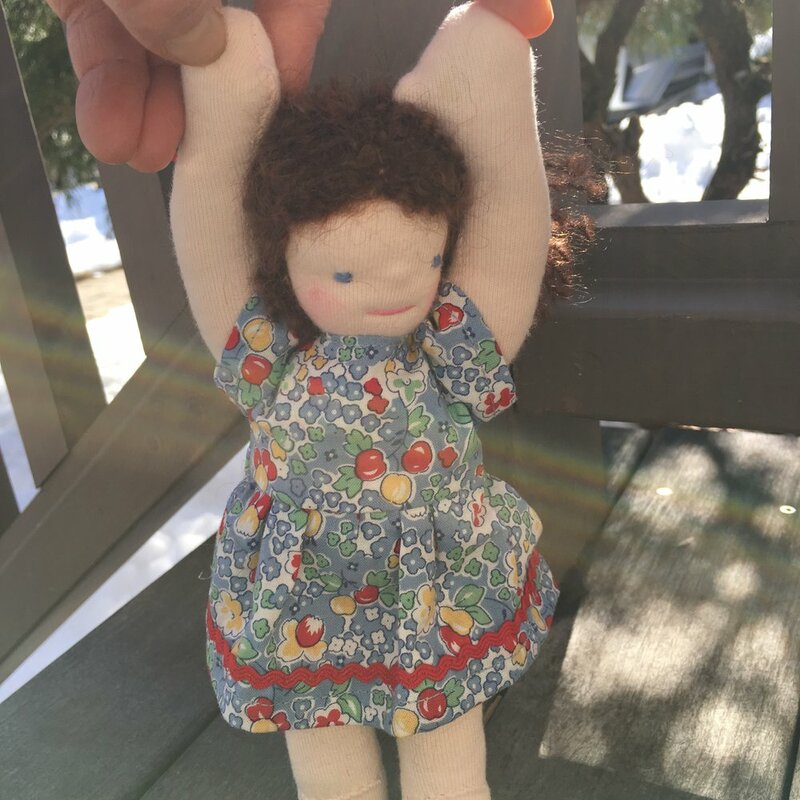 The pattern is the traditional limbed doll found in Maricristin Sealey's book, Making Waldorf Dolls, Creative Doll-Making with Children. I copied the pattern and decreased it to 70% original size with the scanner on my printer. The author does give very good information about the head size for the patterns in the book. But when I decreased the pattern size, decreasing the head size by 30% was just a tad too much. That's why I increased the head size when I made these dolls. Here's another 8" doll I made. 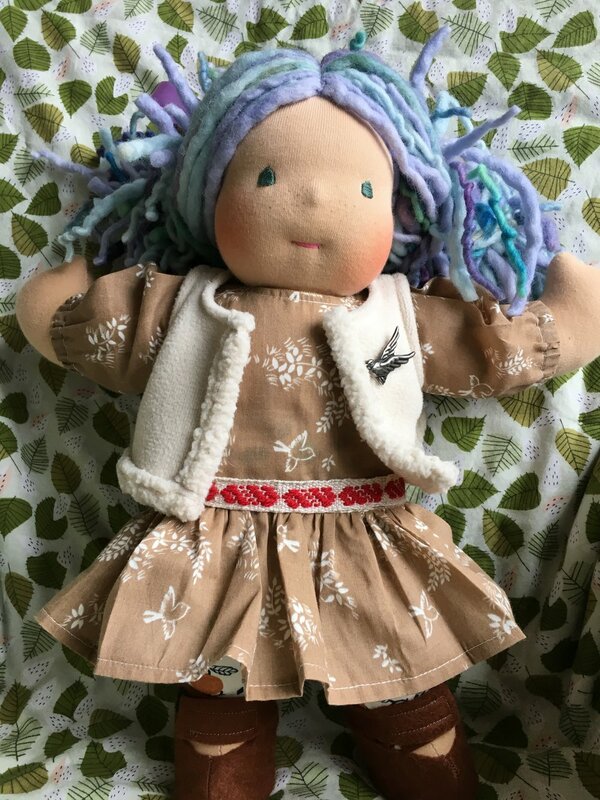 This doll has her arms sewn on with the seams top and bottom on the arm. Her arms are always outstretched. 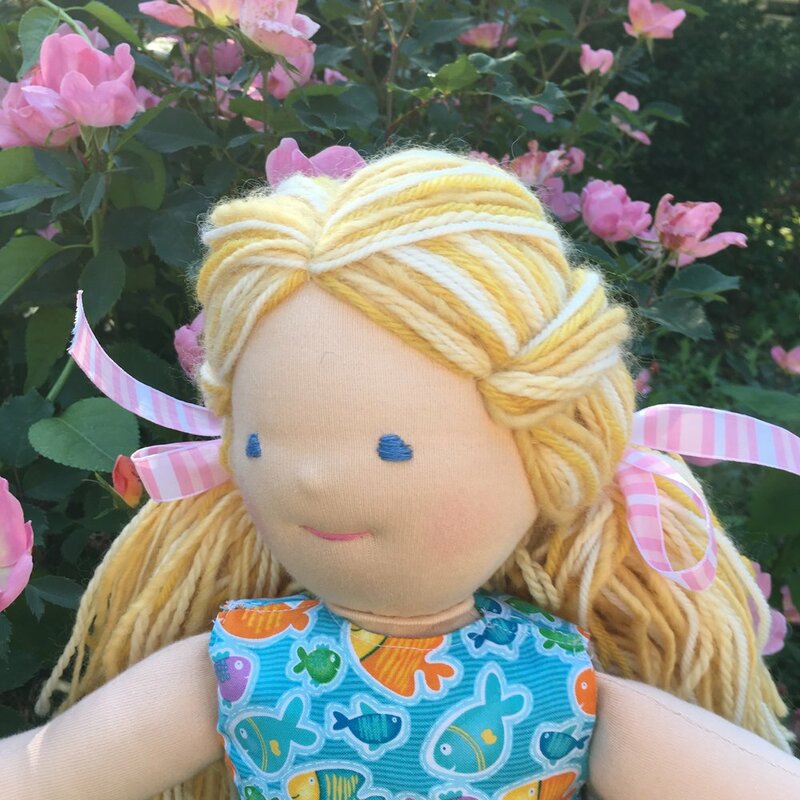 The doll above has arms sewn on with seams medially, front and back. Her arms hang more naturally. It's interesting to see what a difference that small change makes. I happen to like the arms both ways. The pink hair is a mix of a variegated pink/natural/lavender yarn and two other pink yarns. This was fun, but I'll probably stick with more natural hair colors! Oops! 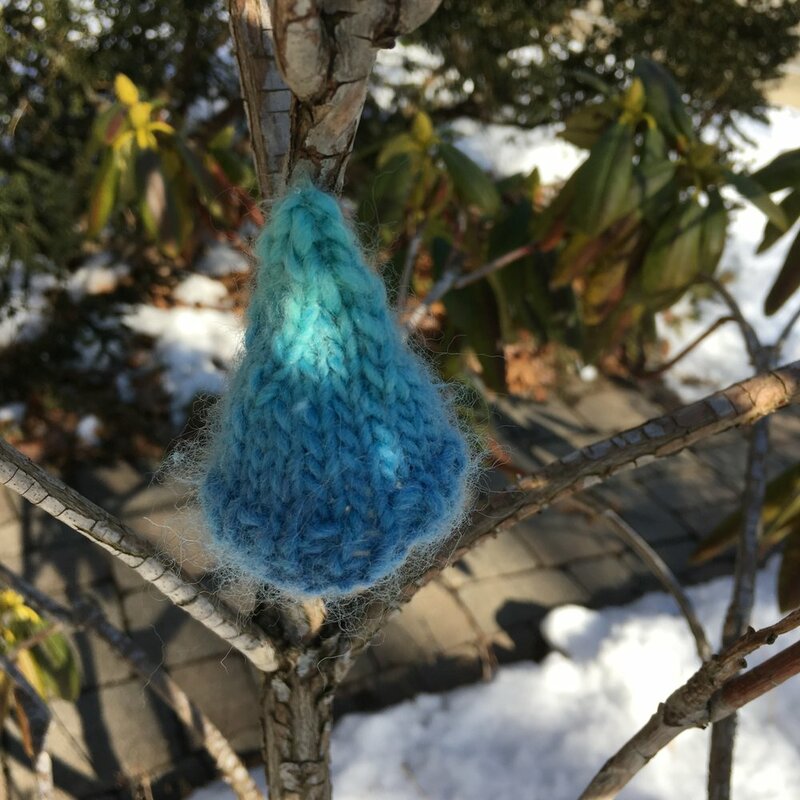 Somebody lost his hat in the rhododendron! Tiny Knit Hat for a Waldorf Type doll with a 4 1/2 inch head circumference. US 6 - 4.00 mm double pointed knitting (DP) needles. Set of 5 DP needles. Cut yarn leaving an 8-10 tail. Using the yarn needle, run the tail through the 2 remaining stitches. Pull tight. Now your tiny Waldorf Doll will have a warm head! If you use finer yarn (such as a #4 yarn using US 5 - 3.75mm needles) or want a slightly larger hat for a 5 inch circumference head, cast on 24 stitches and divide them, putting 6 stitches on each needle. Starting in step 5, knit 1 additional stitch before knitting the last 2 stitches together at the end of each needle. Continue with knitting with cast-off row, followed by 1 knit around row until just 2 stitches remain as in step 13. My inkle loom has been gathering dust. Literally! The band shown above had been on the loom for a long time. I warped the band on two different days and accidentally used two different weights of cottolin thread. I left the warp, but wasn't really happy doing the weaving. A couple of weeks ago, I decided just to cut it off and start something new. Because the band was dusty, I washed it. And of course, now I love it! The band isn't very long but it looks great as a belt on this "Winter Outfit" made by the ladies at Bamboletta for this Bamboletta Sitting Friend doll! I have a new warp on the inkle loom now, doing a simple pink and white cotton band, just to get my hand back into the feel of weaving again. Wait...could that be an Inkle on the back of the loom? (No one is quite sure what an Inkle is, so why not?? He's actually trial of a new little soft doll I'm designing). I think this pink and white band will make a lovely trim for a doll dress! Using my bands on doll dress could become a thing!! Russell, climbing a tree in his stocking feet! I've been wanting a ginger haired boy Waldorf type doll. So I made one! Here's Russell. His named even means redhead in old Anglo-Norman! Russell didn't come together as easily as some of my dolls. When I tied his head, I didn't anchor the strings around the cheeks. Sometimes I do, sometimes I don't. I found out with Russell that it's wiser to anchor them! Here are photos of a head (not his) with the cheek strings not anchored on the left and anchored on the right. When I pulled the tight fabric "skin" over Russell's head, the left cheek string slipped up. I didn't noticed it right away when I could have easily fixed it. But when I did see it what had happened, I figured it probably wouldn't matter a lot. It did. By the time I had the doll's head stitched on to the body and the first layer of head was attached at the center top of his head, a raised ridge had formed across his rather flat left cheek. There was no way to move the strings back on the finished head. What to do??? I finally took a deep breath and decided to carefully clip and unpick all the stitches holding his head to his body. I don't recommend doing this. The fabric skin is a knit and can easy develop runs. I was fortunate. No damage occurred. I was able to pull up his head covering just enough to put the strings back in the proper position. Then I anchored them and stitched the head back onto the body. Whew. Russell now has two chubby cheeks. There is a line across his left cheek where the ridge had been is just barely visible. He's staying with me, so I'm fine with that. I designed most of his clothes except his sweater is pattern which is the "Heart to Heart Pullover Vest" designed for Heart to Heart Bears based in Shanghai, China. It's available on Ravelry.com. I needed to narrow it bit through the body but the pattern made that adjustment easy to do. I drew the pattern for his socks but got the idea to form the toe seam from socks sold by Bamboletta.com. Here are his moccasins. If found some rawhide laces for crafts at Joann's. They are rated safe for children age 14 and older. Fine for my doll, but not something for a young child. But they sure are cute!! Happy November! Today's post is a picture gallery of boy dolls. I'd been thinking about a Waldorf type boy doll that had a mix of blonde curls and straight hair. I only make a few Waldorf Type dolls* a year. 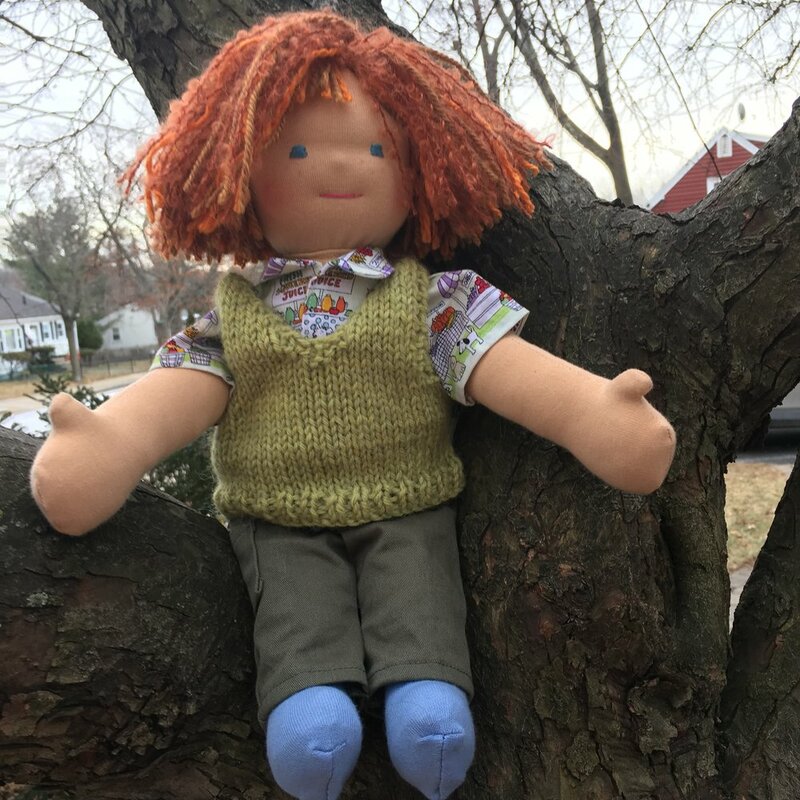 As the weather changed from summer to fall and making a doll with wool hair that is has wool stuffing seemed more doable, I made a pair of Waldorf type boys. Here's Davey, the blonde boy. I love the Farmer's Market design in the fabric I used for his shirt! That's a crab apple tree, loaded with fruit, in the background. Here are a few more pictures. The pocket on the back of his cords is a new addition to my pants pattern. I had fun up-cycling a old SmartWool® sock to make a pair him a pair of striped wool socks! The felt moccasins and the flannel PJs are two new patterns I designed for these boys. Here's the brunette boy I made at the same time. The side part is something new I tried. The hair might be a bit too long and floppy, but it is cute! I drawn all the patterns for my dolls as well as drafting patterns for their clothes. This boy pattern seems to work particularly well. These two little Dudes just make me smile!! * Waldorf Type dolls are made with knit cotton fabric for skin and have wool roving or batting for stuffing. Their round heads are make of wool rolled into a ball and shaped with a covering of knit stockinette and string before being finally getting covered with the knit cotton skin. They can be very simple or elaborately detailed. 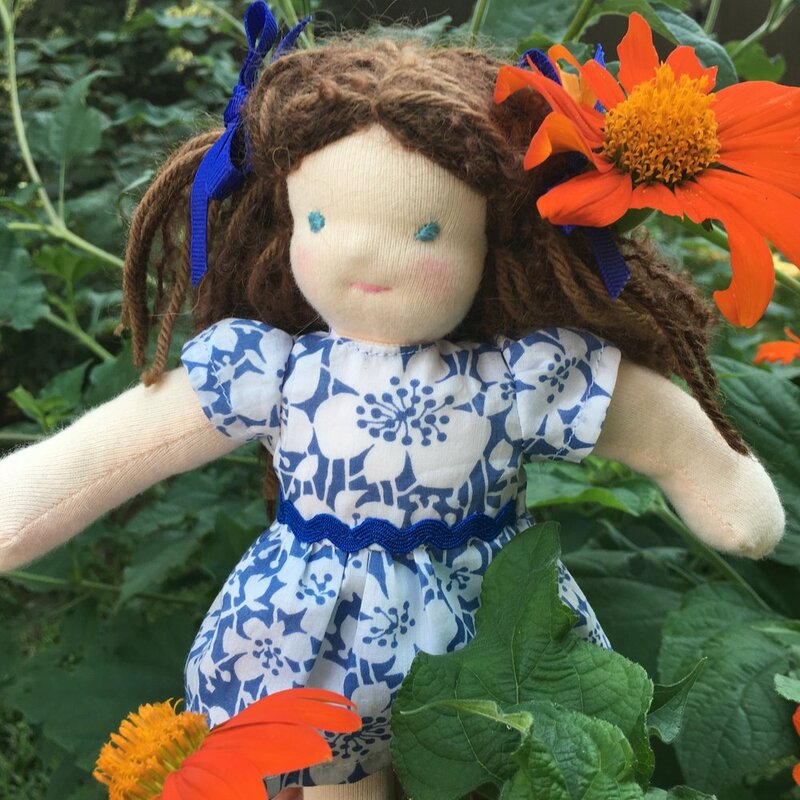 All the dolls are handmade and one-of-a-kind. I've been waiting for months to share my newest Waldorf type 16.5 inch doll. She's finally gone to my niece's 3 year old so she's no longer a secret! I started sewing this doll last summer. So I've had lots of time to create quite a wardrobe for her! Below are the outfits that I sent with her. Fleece jacket (her new person has a matching hoodie! 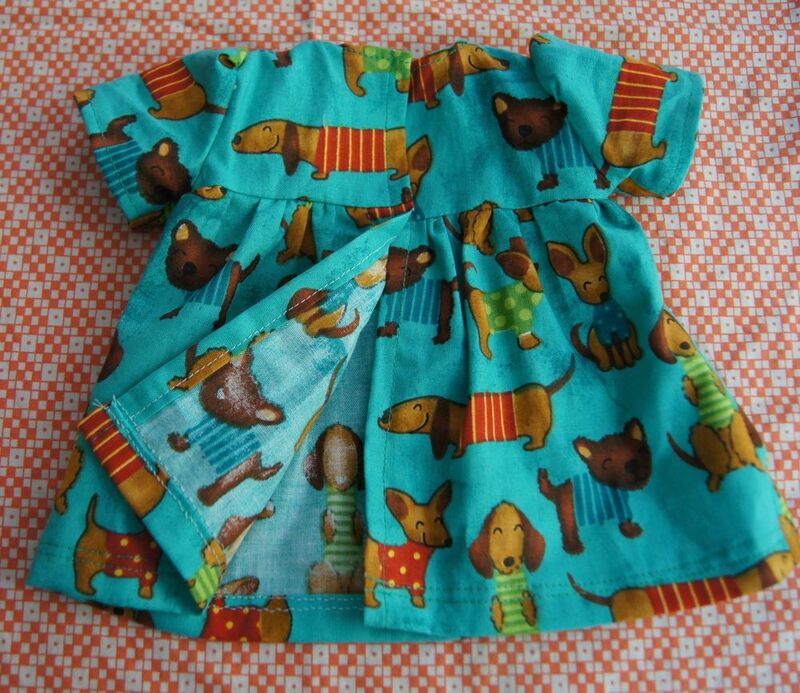 ), Birthday Party dress, summer sundress, and summer shortie PJs! Her purple Mary Jane felt shoes are a new design for my dolls--my dolls usually get felt clogs. I used an IKEA® bag clip as a hair barrette figuring it might be easier for young fingers and less likely a risk for accidentally swallowing! I so hope this doll will be our family's little cutie's new BFF! Here are two more outfits...Shhhh...These are still "secret sewing"! But they were just too cute not to photograph while I still had to doll to model them! (That's a pull-on set of mermaid fins in the lower left photo)! In my last post, I promised to show some of the clothing I've made for my 9 inch Waldorf Style Baby Doll. Safety Note: There are buttons on some of these outfits. DO NOT USE BUTTONS on doll clothes used by children under age 3 due to risk of choking. Here is Lucy Birch wearing a pink and white heart dress, with short sleeves, full skirt and a ribbon detail at her waist. She is wearing purple felt booties. Sometimes I add ribbon ties to the booties, but these are simple pull on booties. Here is Lucy Birch in her chicken-and-egg sun dress! This outfit makes me giggle! I love everything about it! Here she is wearing a leggings! This outfit was a Valentine's Day present for a young friend's baby doll. Here's another of my baby dolls, all ready for bed, in her cotton knit polar bear nightgown! This was a first time I'd drafted a pattern with raglan sleeves. This pattern can easily be modified to make a summer baseball T-shirt. And finally, here is Lucy Birch, out in the winter kale patch, wearing a warm corduroy dress with purple ric rac detail. My next pattern drafting project will be designing pants and shorts for this baby doll. 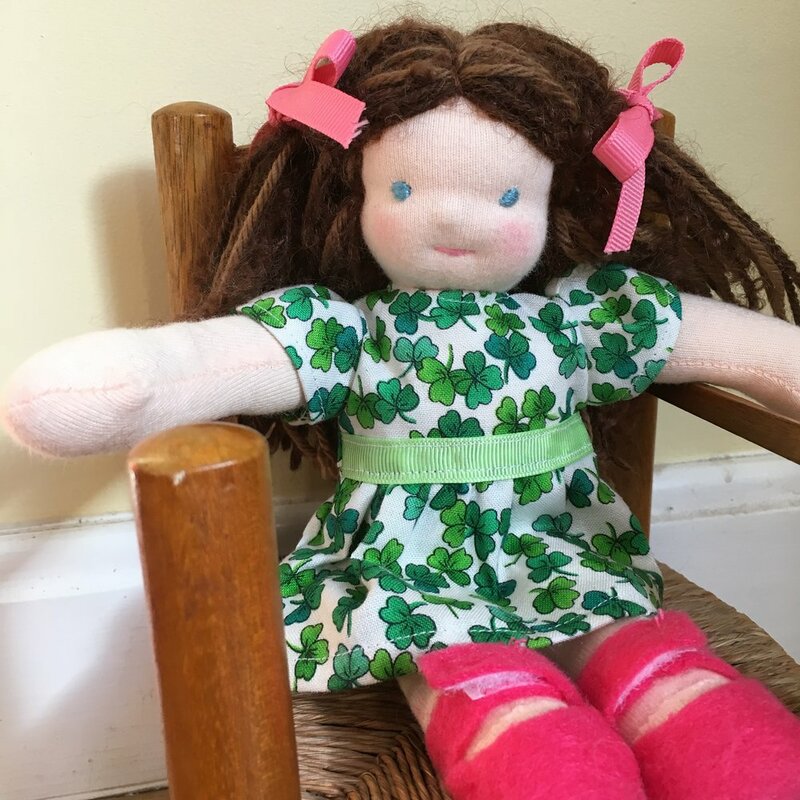 I love making clothes for this 9 inch doll but they are more challenging to sew than the outfits I make for my larger 13-15 inch Waldorf style dolls. Here's Lucy Birch. She is the third 9 inch Waldorf Type Baby doll I've finished. She the "model doll" that I use when I design new clothes. I probably should cut her hair a bit shorter since she is a baby, but I like this blonde bob on her! 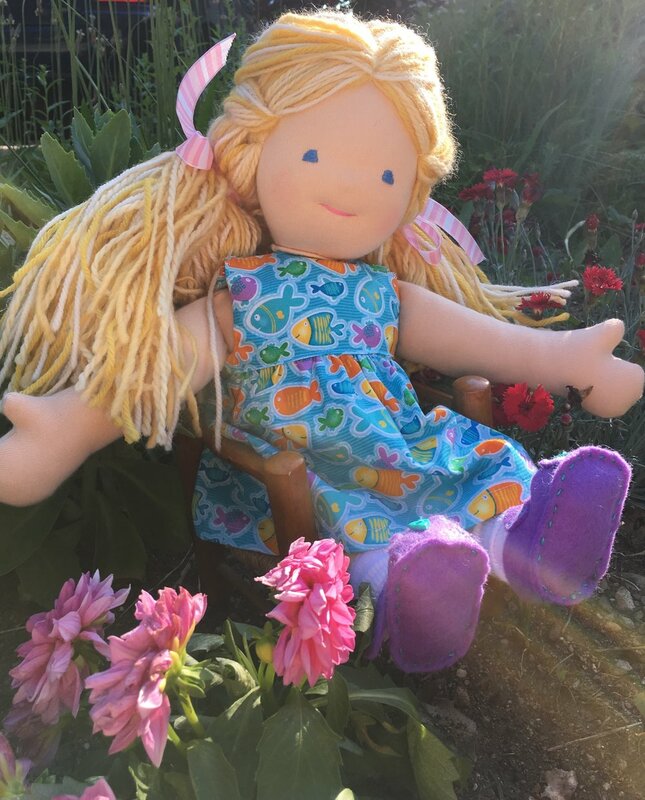 Because I designed the pattern for this doll, I also have to draft patterns for her clothing. I don't have any formal training in pattern design so the clothes are often more of a challenge than designing the doll! Lucy Birch is a baby doll. So she needed diapers, not under pants. Her diapers are a layer of quilting cotton on the outside and a fine fleece on the inside. I used fold over elastic at the waist and a strip of folded ribbon with Velcro® stitched on to make the closures. I'll share some baby girl outfits in another post! Last summer I started working on a design for a small Waldorf type baby doll. I have designed patterns for 13 to 15 inch boy and girl Waldorf style dolls. But I wanted to try making a smaller doll. I drew an initial working pattern and made the torso with arms and legs. Something just didn't seem right but I wasn't sure what needed to be changed. That prototype sat on my work table for 4 or 5 months. Then one day I decided to finish the doll. Waldorf doll knit fabric skin is expensive and so is the wool stuffing. So I made a head and and sewed it on the doll. As soon as the doll had I face, I was in love! But I still had design issues. The first head I made was too large for the body. I carefully un-sewed the first head and rolled a smaller one which was perfect. I also decided to make the legs a bit longer and the torso a bit rounder. The doll above was made with my final pattern. The doll is 9 inches tall. It's arms are open and legs flexed like a newborn baby's. The doll body fits perfectly in my adult hand. I like all the dolls I've designed but this little baby has really captured my imagination and my heart! Here are the 3 new Waldorf style dolls I recently finished. Each child chose the coloring for her doll, the colors and styles of the clothes and the accessories! It's the first time I've been asked for necklaces! Making the necklaces was a lot of fun and these girls are old enough so it isn't a safety concern. 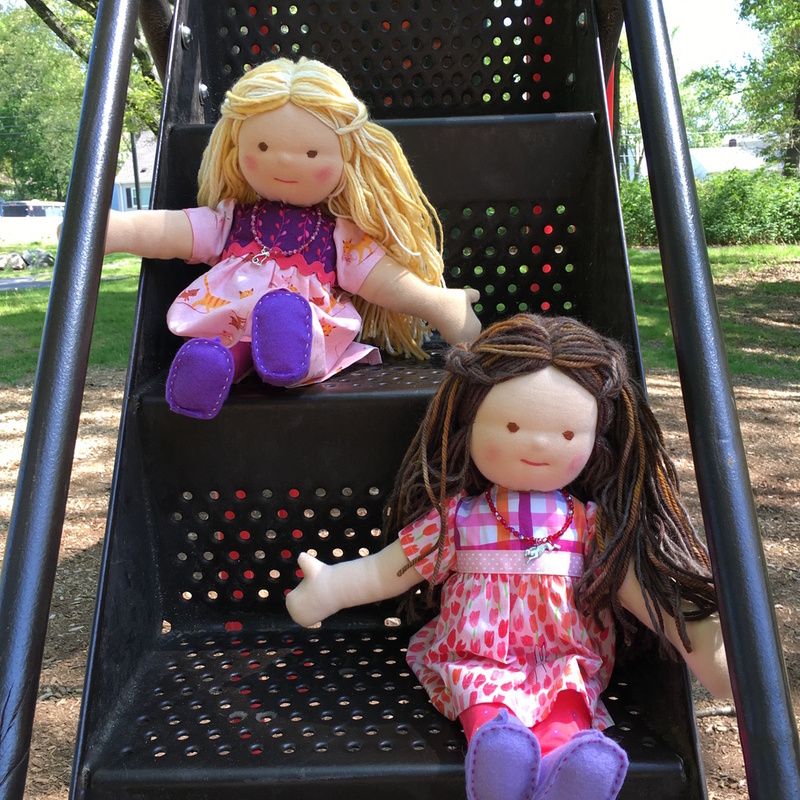 Here they are on the steps of the slide at a local park! Already having fun! The 14.5 inch Waldorf style dolls I made recently are a quirky size. They dolls come in all sizes from about 9 inches to 18 inches. My doll is just a bit shorter and leaner than the typical 15 Waldorf doll. So, having drafted a pattern of my own for the doll, I had to draft a pattern for her clothes. I'm better at drawing patterns for dolls than drafting dress patterns! I cut out a trial pattern and made a test dress. It was a bit wide in the shoulders so I cut back the yoke a bit. The dress fit was much better after the alteration! The front detail is a 1/4 inch wide ribbon, stitched onto the yoke after I attached the front skirt panel. Ric Rac would or cotton lace would be cute too. The back is open. It will have hook and loop strips closures. When I took these photos, I hadn't sewn them on yet. I have a idea about how to make the same dress with a fancier sleeve. Hmmm.